Swimmers will be escorted around a marked course by their individual kayakers with buoys lit for navigation. Swimmers are required to wear 2 LED adventure lights attached to them for this night swim. These can be purchased from the BLDSA shop for £9 each. All swimmers need to be accompanied by experienced kayaker. The swim organizer will endeavor to provide kayak support for you where needed and for this reason the swimmers may start at a different times depending on numbers. Swim places depend on available kayak support, which will be allocated on first come first serve basis. To ensure a place please try to provide your own competent kayaker. One of our toughest swims on the calendar, but not for the total distance (9 miles). You will swim each of the three events (Non-wetsuit only), but with an interval between each swim and the challenge is not getting too cold swim to swim and being able to complete the 3 events. The senior Champion of Champions events will consist of three swims – over 10 laps, 6 laps and 2 laps of a designated course in Dover Harbour. Each lap will be 1/2 mile – the course being set using GPS. All competitors shall enter all 3 events. Water Temperature for this weekend of the year has averaged 14.3 degrees celsius over the last 10 years. The event has taken place in lower temperatures (12 degrees in 2013) so make sure you are prepared. Come with a buddy for support, make sure you have lots of hot drinks plus nourishment you can access between swims. A small tent is advisable to keep you away from the elements between swims. Only open to BLDSA members and this is a NON-WETSUIT event. Juniors MUST have a Parent or Guardian present AT ALL TIMES during the events. Report to the Swim Secretary upon arrival at the Start site at ‘Swimmers Beach’ (on the beach opposite Cinque Ports Yacht Club) from 8am. Please Note, attendance of the briefing is mandatory – failure to attend this will void your entry. This will be held on the beach. Will be around 3 buoys spaced out in approximately a triangle which will be set within the broader designated swimming area of Dover Harbour. This is clearly marked out by yellow buoys. Swimmers must pass outside each of the buoys on each circuit in a clockwise direction. Each time a swimmer passes the start point at the completion of each lap, they must clearly give his/her number to the Lap Recorders who will be in the lap counting boat. The start, finish and more details of the course will be outlined at the briefing. Sorry you will need to ‘Pay and Display’ about £7.00 all day on the sea front. Other car parks are available near by. Most sea front hotels offer free parking. More details on Parking are available at Dover Council website, see below for link. Safety cover will be provided by ca. 8-10 canoeist lifeguards, and by the BLDSA rescue boats. Given the difficulty in ensuring sufficient canoe cover, swimmers are encouraged to bring their own canoeists if possible. The presentation will take place on the beach at approximately 6:00pm. Trophies will be awarded to the winner of the Ladies and Gents Champion of Champions event. Certificates will be awarded to all swimmers completing the full Champion of Champions event. Certificates will also be presented to all competitors finishing individual races. * The swim is early in the season and water temperatures can often still be cold. In 2013 the temperature was 12 degrees celsius and in 2014 the temperature was 15 degrees celsius. The average over the last 10 years during this weekend in Dover is 14.3 degrees. Do not fool yourself by training in 20+ degree conditions thinking that will be the same! * The harbour is the largest man made harbour in the UK and can be influenced by wind and swell out side the protective breakwaters. * The harbour is also subject to tidal flow (The swim course is in a low flow area and parallel to the swim). Serious training is needed before attempting an open water of this magnitude, nevertheless all the above will add to the enjoyment of the swim and I encourage you to enter. The BLDSA has in place Anti-Bullying and Child/ Vulnerable Adult Protection Policies. Copies of which may be obtained from the BLDSA Hon. Child Protection Officer. The BLDSA Champion of Champions (North) will be held on the 22nd June 2019. The event is a week after the world famous & gruelling BLDSA Champion of Champions (South). 6jul11:00 amBLDSA Torbay8 miles Senior, 4 Miles Veterans. Freestyle/Breaststroke. If supplying your own canoeist they must be experienced in sea conditions. The BLDSA Torbay Championship takes place across a large, semi-circular bay on the south coast of Devon, famous for its beautiful long sandy beaches, stunning views, red sandstone cliffs and crystal clear waters. 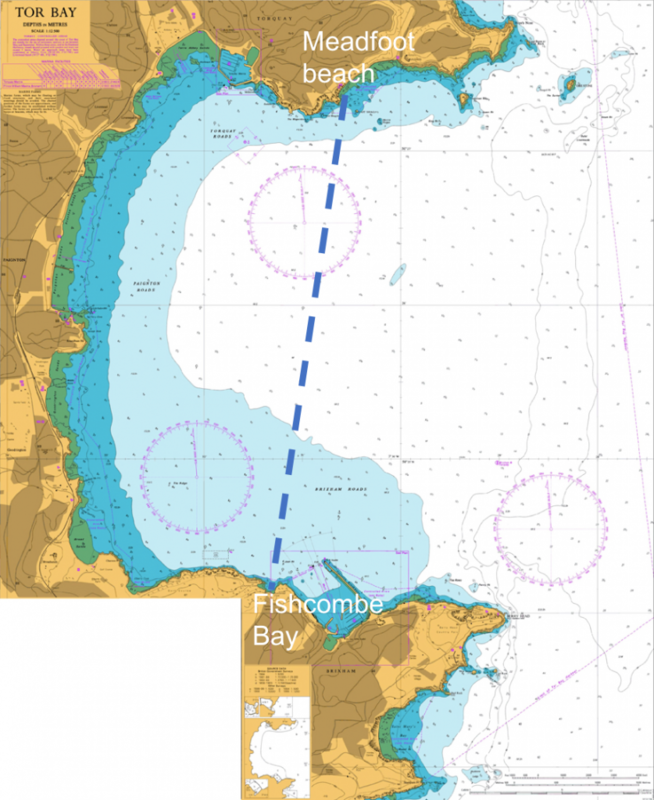 The 8 mile starts from Meadfoot beach in Torquay across to the turnaround point at Fishcombe Cove near Brixham. It’s recognised as one of the toughest swims on the BLDSA calendar and a history dating back to the 1950s and still has records that stand from the 1980s, where Karen Toole set a record time of 2 hours 42 minutes (1983) and Lyndon Dunsbee in 2 hours 40 minutes (1986). The event remains only one of two sea swims that the association runs annually. This event is NON-WETSUIT only. *Swimmers must be members of the BLDSA before entering and must be experienced swimmers (Torbay – Ideal experience for swimmers). Swimmers must have a kayak with escorting them for this event, this can either be provided by us for a fee or you can bring your own. If you decide to bring your own, they must be experienced in rough sea conditions and ideally should have a BCU 2 star award. The swim starts from Meadfoot Beach in Torquay across to Fishcombe Bay and then heads back to Meadfoot. Having a good kayaker for this swim is essential since the swimmer can’t navigate and the kayaker can see how the currents are pulling the swimmer. In general, the bay is quite well protected from strong winds – but the race is still very weather dependent. In lead up to the event, the swim secretary, safety officer and race controller will keep a vigilant eye on the forecasts. Usually we use a combination of the following to judge what the conditions may be like; (1) Advice from the coastguard and harbour master in Torbay (2) the met office Inshore Forecast, (3) BBC Weather, (4) Wind Guru and (5) The main shipping forecast. We also have a wealth of experience of the conditions in Torbay from Paignton Sailing Club who help with our safety boat support and have really indepth knowledge of the bay. Our kayakers that we supply are locals too, highly skilled in dealing with tricky sea conditions. With this combination, we’re able to make a well informed decision on whether the race is safe to go ahead, what sort of conditions you as swimmers are likely to face and give you tips on dealing with those too before the start. if you’re unsure on anything – please just ask us, we’re here to help! Mirfield, W Yorks, WF14 9BL. 14jul12:00 pmBLDSA Bala (North Wales) - Sunday3 miles Junior/Senior. Freestyle/Breaststroke. 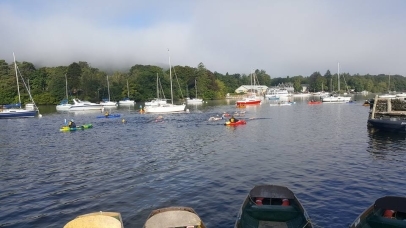 28jul12:00 pmBLDSA Coniston (Junior & Senior)5.25 miles Senior/Junior. Freestyle/Breaststroke. Coniston Water is a beautiful lake set in the stunning scenery of the fells where you can join this popular event. 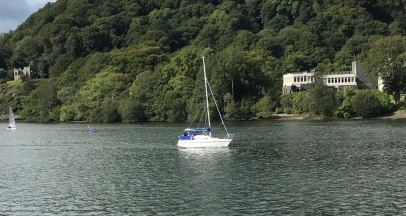 Test yourself to swim the 5.25 miles in the sweet tasting clear water that was so loved by Arthur Ransome and his children of ‘Swallows and Amazons’. 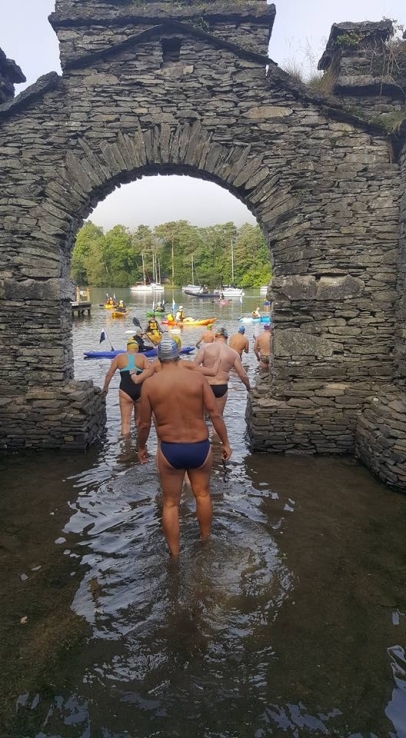 The course goes from Water Park at the southern end of Coniston Water and you swim until you run out of water, finishing at Monk Coniston at the northern end of the lake. Transport will be provided for all swimmers to the start, we ask that kayakers and supporters make their own way there. However, please note that we are not allowed to park at Water Park – but you can drop off kayaks in advance. This is why we allow so much time between the briefing and the start (see below). You WILL have time to organise all of the logistical requirements, so all swimmers and kayakers MUST attend the briefing. This swim is for BLDSA members only, but open to Juniors, Seniors and Vets, and is for skins swimmers only. We are recreating one of our toughest swims on the calendar, The BLDSA Classic Champion of Champions 9 mile challenge. Each competitor will swim the three events (Non-wetsuit only), with an interval between each swim. The challenge is getting warm, refuelled and then getting ready to get back in the cold water for the next event. The senior Champion of Champions events will consist of three swims –5 miles, 3 miles and then 1 mile- 10 laps, 6 laps and 2 laps of a designated course. Each lap will be 1/2 mile – the course being set using GPS. All competitors shall enter all 3 events. To complete the full Champion of Champions event, competitors must complete all three swims and the Championship placings will be decided on the basis of the lowest aggregate times. We recommend swimmers bring food and drink to refuel, suitable warm, dry clothing to wear between events, and bring a support buddy to look after you and cheer you on. Report to the Event Swim Secretary upon arrival. The registration point will be signposted at Holyhead sailing club from 8am. A ½ mile course will be clearly marked out in the harbour off Newry beach. Swimmers must swim around the outside of each of the buoys on each circuit as detailed in the swim briefing . Every time a swimmer completes a lap, they must clearly give their swim number to the lap Recorders. The start, finish and position of the lap recorders will be outlined at the briefing. The 2 BLDSA fast rescue boats will be in attendance at the event and will be supported by support kayakers and other support vessels dispersed around the course. We will have designated first aid support available throughout the event. The presentation will take place at Holyhead Sailing Club . The Championship will be held in Holyhead, on the beautiful Isle of Anglesey. We are bringing the popular Champion of Champions event format to Wales. Many swimmers over the years have taken on this challenge in locations in The South and North of the UK to help prepare for channel solo and relay swims. By locating the swim in Holyhead we can hopefully some local swimmers from Wales and swimmers from over the sea but in easy reach on The Isle of Man and Ireland to take on the event too. There are also plenty of Campsites around Holyhead. 3aug12:00 pmSandown to Shanklin Sea Swim2 miles tidal assisted. Sandown to Shanklin Sea Swim is a 2 mile tide assisted sea swim which takes place some distance from the shore line across Shanklin Bay and is run under BDLSA rules. The date of the swim is Saturday the 3rd of August with a 12.00 noon start from Sandown Pier. Entry Forms and all details are now available on the IOW Marlins Swim Club website. This includes details of hotels in case you want to have a weekend on the Isle of Wight. After last years trial we will now be allowing wetsuits, for which there will be fastest male and female trophies. Each lap will be 1/2 mile – the course being set using GPS. Certificates will be presented to all competitors finishing individual races. The 1km and 2km events will both take place again. Junior swimmers between 12-15 years can enter the 1km event. For those who don’t know the Dee Mile is unique and very historic to Chester and to open water swimming. The event has gone from strength to strength and attracts a large field. If there are any other details that you require please let me know.. This is a classical race of the modern era, with a history which is very nearly continuous, going back to the first time it was held 1922. The race has several idiosyncrasies. It starts at the Red House pub and the distance is actually a mile and a quarter. You swim downstream around the Crook of the Dee to finish at the suspension bridge. Being all downstream, the course times vary considerably depending on the seasonal flow with the winning men’s time varying from 19 minutes 48 seconds to 33 minutes 25 seconds. Water temperatures are typically 14 to 16 deg.C. The swim is with the current. In 2010, the temperature was 20 deg.C. The race retains its ancient “Dee Mile Champion” title for the fastest swimmer, who must also live within five miles of “The Cross” in the centre of Chester and swim without a wetsuit. A 7 mile swim in a stunning location under the shadow of Hellvellyn, make it a weekend away in the beautiful lake district camping or in the comfort of a friendly B&B. After the swim enjoy some lovely food and banter at the presentation in a local pub in Pooley Bridge. Own boat and crew to be provided. 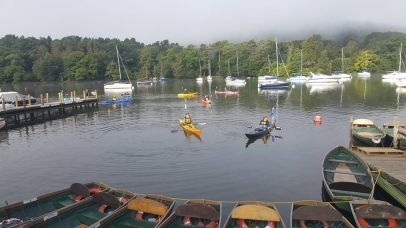 18aug9:00 amBLDSA Derwentwater2 miles, 5.25 miles Junior/Senior. Freestyle/Breaststroke. A 5.25 mile triangular swim around Derwentwater. No wetsuits. Starts from Keswick Launch Piers, Keswick, Lake District. 2 mile swim starts at Kettlewell Beach, NT, Car Park. Wetsuits allowed, but you will not enter the Championship. All swimmers need individual Kayak support. Inflatable Kayaks are not allowed. This swim is the day after BLDSA Ullswater swim and some swimmers like to do both swims. Alternatively some swimmers pair up and swim one of the swims and paddles for the other one. An additional certificate will be given if you swim in both of these double weekend events. 2019 is the 60th Anniversary of the first solo swim of Loch Lomond by Commander Gerry Forsberg. Only around 60 swimmers have since completed this challenging swim, so in 2019 we are having a celebratory relay swim on Saturday 24th August. Teams will have a staggered start to finish around 8pm, so for some it will be a very early start. The spirit of the event is one of fun and celebration, so rules will be at a minimum, and the expectation is that participants will act within this umbrella. Each team will be led by a previous solo swimmer, who must be in current membership of the BLDSA, plus 3-5 others, who need not be members. Changeover points will be at various intervals, allowing team members to complete legs from approx. 0.5 to 5 miles, according to their wishes and capabilities. Reduced price accommodation will be available on Inchmurrin, by kind generosity of Morag Scott and her family on a first come, first served basis, where there will be a celebratory event on the Sunday lunchtime. The cost is £250 per team, with a non-returnable deposit of £50 required to book a place, the rest payable by one month before. Entries will be capped at around 15 teams or when the Safety Officer considers it wise to do so. The Sunday lunchtime event will cost £10 per person. The two BLDSA Safety boats will be on the Loch, but each team is required to be self-sufficient with its own escorts on land and water. Kayaks will be allowed. There is a small organising committee of Janet Wilson, Jean Wilkin- Oxley and Caroline Lewis, so please ask one of them if you have questions. A cheque for £50 plus the names of the swimmers should be sent to Janet Wilson, 20, Padgett Court, Ben Rhydding Drive, Ilkley, West Yorkshire. LS29 8AU. Further information will then be sent. 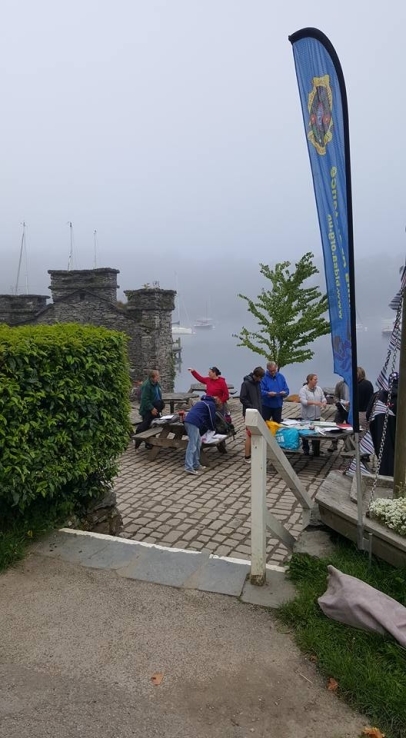 31aug9:00 amBLDSA Windermere10.5 miles Seniors. Freestyle/Breaststroke. 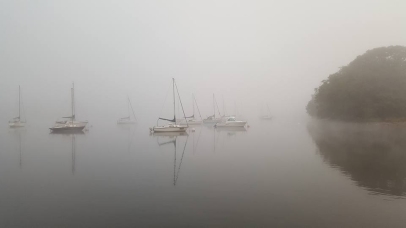 Windermere is the longest “Lake” in England with a rich history of people completing the swim. 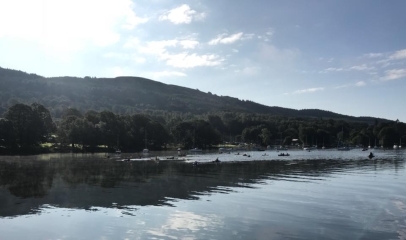 The swim starts at Fell Foot park and finishes at the top end of the lake just after Ambleside Pier. At 10.5 miles it’s a challenging and iconic swim but you will be treated to beautiful scenery all the way up the lake. Why not join us after the swim for a meal and presentation with your fellow swimmers. Rowing boats provided but swimmer must provide own crew. Pre-requisites include an open water 5.5 mile swim in 3.5 hours and NO Wetsuits. Become a member of the BLDSA! In 1956, the BLDSA was formed by a group of keen swimmers who wanted to protect and promote the interests of long distance swimmers. Since its origins, the BLDSA has developed the rules under which swims are completed, recorded and recognised. By becoming a member of the BLDSA you become eligible to enter BLDSA swimming events across the country.